We hear about foraging for food in the wild for things like berries, mushrooms, greens, and edible roots, but did you know there’s a whole bunch of delicious veggies in our gardens right now that we completely overlook? Those broccoli leaves we peel off? Tender and delicious! The leaves and tendrils on pea plants: so sweet! And the flower buds of kale? Delightful! Once you know you can eat these plants at various parts of the growth cycle—not just traditional harvest time—a whole new world of edibles opens up. If outdoor space is limited, you may enjoy How to Grow Vegetables Indoors Year-Round. Are you overlooking delicious foods growing in your garden? We tend to think of vegetable growing with the end goal of harvesting mature plants but there are also unexpected edibles throughout all the growth stages from shoots to flowers. Start thinking about vegetable growing as a continuous harvest and you will have plenty to fill your plate all season long. If it’s safe to eat, give it a try! There are hundreds of examples. I love mixed salad greens (and I grow them year-round both indoors and outdoors), and the list of what tastes delicious in the salad bowl just keeps growing! Many plants are actually edible throughout their growth cycle and taste best before they are mature. This includes all sorts of sprouts, tendrils, and young leaves with a distinct sweetness and tenderness that the mature plants do not have. To prepare my meals, I go out to the garden with clean scissors, and clip off anything that looks good from the young plants (see examples below), taking just a few leaves from each plant. The plants continue growing and I get to enjoy the best parts, over and over again. Radishes are really fast-growing and the tender leaves are delicious raw in salads as well as stir-fries where they give a zippy flavour. I’m not actually a fan of the overpowering taste of many radishes but I find the greens really delicious. Don’t peel broccoli leaves off the stems and toss them! They have a sweet, fine broccoli flavour perfect raw or cooked. Pea shoots are those little curly tendrils with a few tender young leaves. Clip off the ones that don’t have flowers on them: they will regrow several times. Pea shoots are particularly sweet in the cold spring and fall weather. Yum! I don’t really enjoy them but I wanted to mention carrot tops because it’s a popular myth that they cannot be eaten. The truth is, they are indeed edible and can provide a good flavour boost to various raw and cooked meals. I regard them as a garnish like parsley but give most of them to our rabbit who has first dibs. There’s a common old habit of peeling away many outer layers of a cabbage and using the core. Those outer leaves are actually perfectly fine to eat. Grate them for slaw or use the in a soup or stir fry. I am a total Brussels sprouts fanatic and I remain convinced that most people who don’t like them have simply never had them cooked properly. I do mine in a cast iron pan with olive oil, salt, and pepper and it is one of my all-time favourite foods. I actually wake up in the night sometimes with a craving for them! While everyone knows to eat the little round cabbage-like sprouts, few realize all the leaves on the stem are also edible and taste just as good. Garlic scapes are probably the most well-known example of edible flower buds and to know them is to love them! Those ornate seed buds are delicious gently sautéed in butter with a dash of salt. Never fret when your radishes bolt. The seed pods are delicious. Plus, they add a zingy taste to salads as well. You will thank me. A little olive oil and salt, raw or sautéed, and my oh my, these are good. Catch the buds and flowers before the plant is exhausted and they are sweet and fine. There are hundreds of edible flowers. I value them more as eye candy than food, finding the texture rather odd and unpleasant, but if you’re interested, do your homework first to make sure you’re making safe choices. These poor guys get chopped off and tossed in the compost without a second thought. I use them several ways: grate the stem finely and add it to salads or stir fries. The stems are also very good in green juices and smoothies. This is just the beginning! 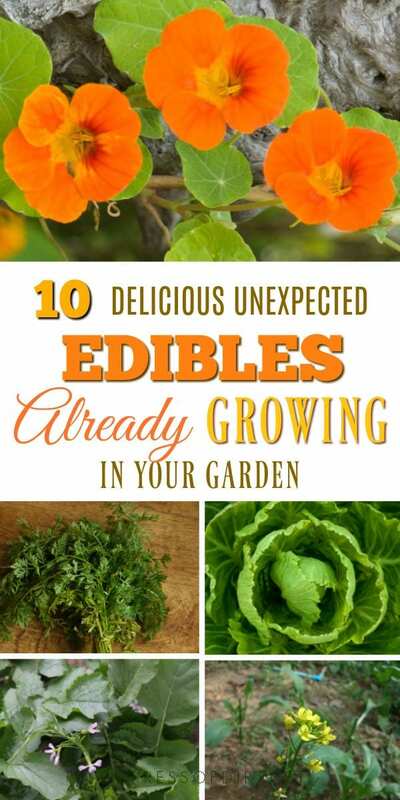 If you have some favourite unexpected edibles, I’d love to hear about them. 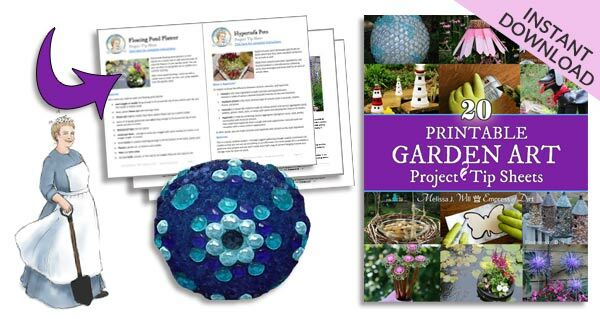 The top 20 project tips sheets for creative garden art tutorials. A friend of mine is crazy about the flower buds of Dandelions! When they begin to grow in spring she forages her garden for them. They need to be cut when they are still closed and have not developed a stem, right above the ground. She sautées them with a bit of butter and swears that this is one of her garden highlights of the year.